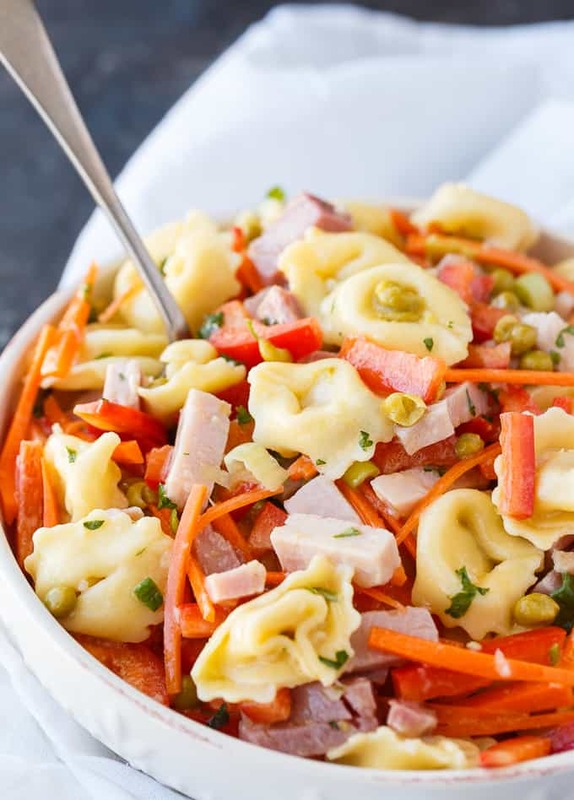 Tortellini Salad is a colorful pasta salad is packed full of flavor with tender pieces of ham, cheese tortellini and fresh, crisp veggies. 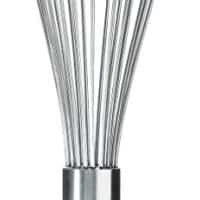 Serve it at spring and summer parties! 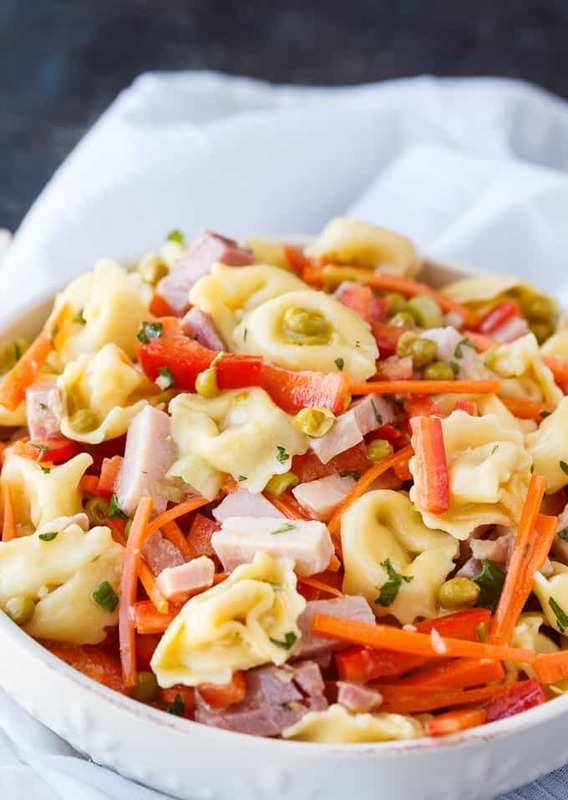 I love this Tortellini Salad because of it’s vibrance and incredible taste. Tortellini is my favorite type of pasta to eat. If you haven’t used it in a pasta salad yet, you are missing out. Each time I bring this easy pasta salad with me to parties and BBQs, it’s always one of the first dishes gobbled up by hungry guests. No one can resist a hearty helping! As you can guess, the pasta used is tortellini. I use fresh cheese tortellini found in the deli section of my local grocery store. It also has chopped cooked ham as the main protein. If you want to make it vegetarian, you can leave the ham out. As for veggies, you’ll find red pepper, carrots, peas and green onions. You can use canned green peas or thawed frozen peas. The frozen peas will have a more vibrant color. The dressing is super yummy! It’s a mixture of vegetable oil, white wine vinegar, Dijon mustard, fresh chopped parsley and minced garlic cloves. I’ve been adding Dijon mustard to my homemade salad dressing recipes lately. I love the kick of flavor it adds. 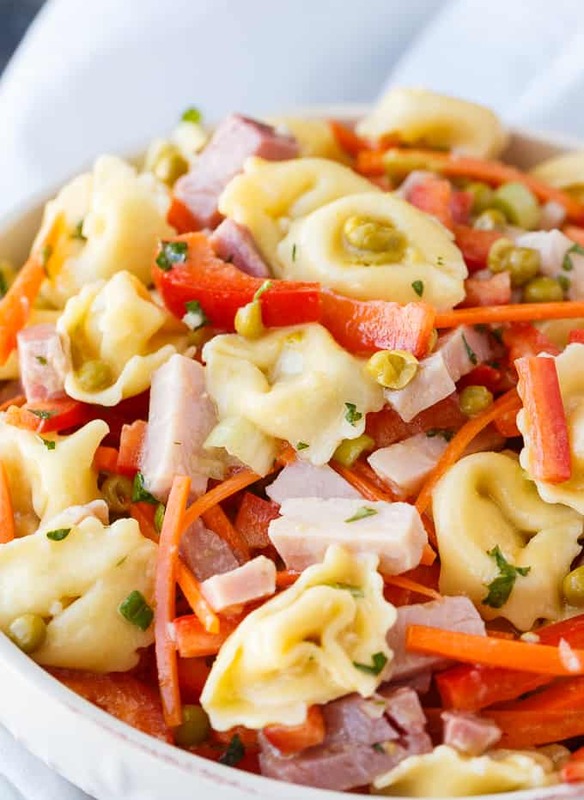 Grab a big bowl and add the cooked cheese tortellini, ham, red pepper, carrots and green onions. Give it a good toss to combine. In a small bowl, whisk together vegetable oil, white wine vinegar, Dijon mustard, parsley and garlic. Pour over the salad and toss to combine. Chill in the fridge for two hours before serving. Store any leftovers covered in the fridge. 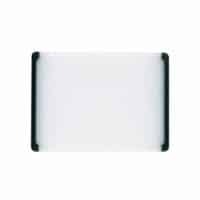 These tools will help you prepare this recipe. 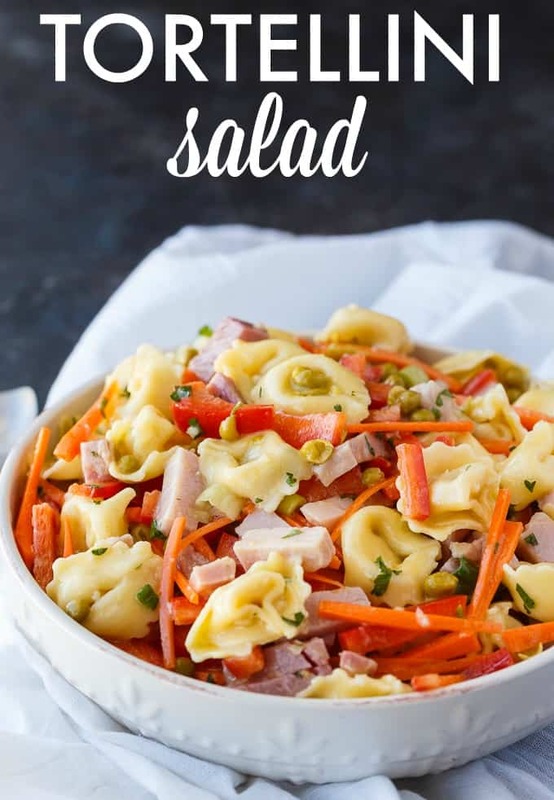 Love pasta salad? I have more for you to enjoy. Chicken Caesar Pasta Salad – So creamy and tasty with all the flavors you love from a classic Caesar salad. Italian Pasta Salad – Packed full of deliciousness, this pasta salad will be a hit at your summer gatherings! Pesto Chicken Pasta Salad – Tender white chicken morsels, fresh veggies, black olives all wrapped in a flavourful pesto sauce. Creamy Curried Chicken Pasta Salad – Creamy, mildly spicy and absolutely delicious! Serve this summer side at your next backyard BBQ, picnic or potluck. Grilled Butter Chicken Pasta Salad – This delicious summer recipe packs a huge flavour punch! It’s creamy and mildly spicy and is a hit at summer BBQs. 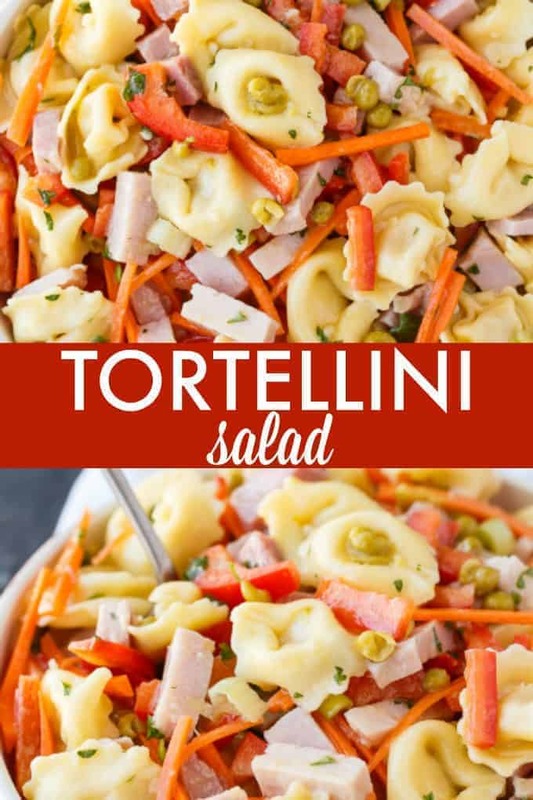 Do you like tortellini in your pasta salads? 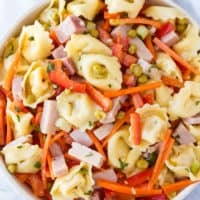 This colorful pasta salad is packed full of flavor with tender pieces of ham, cheese tortellini and fresh, crisp veggies. 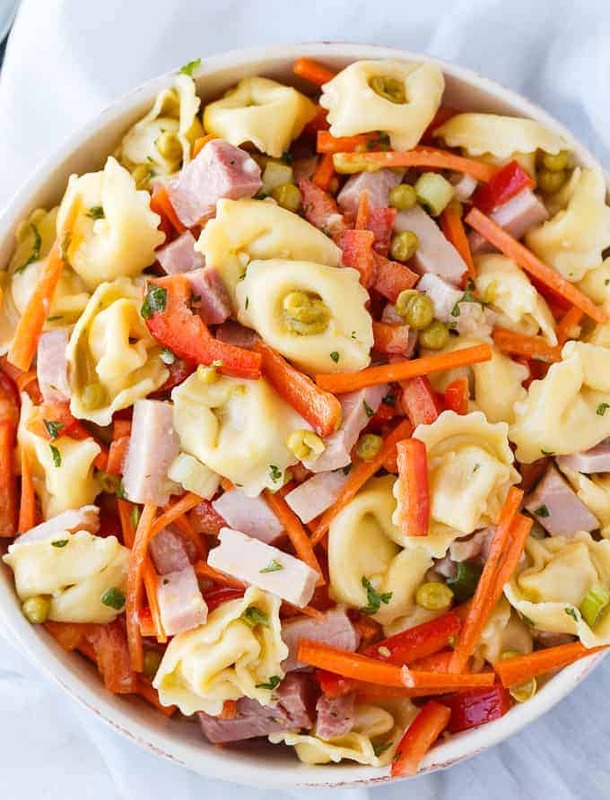 Add cheese tortellini, ham, red pepper, carrots, peas and green onions to a large bowl and toss to combine. In a small bowl, whisk together vegetable oil, white wine vinegar, Dijon mustard, parsley and garlic. 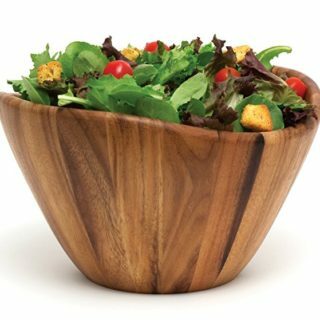 Pour over salad and toss to combine.